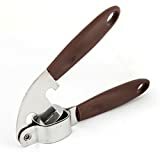 The garlic press is designed with plastic handle and silver tone metal hole groove, which is used for pressing garlic into pieces. Metal Crush Tooth back is used to crushing the garlic completely. Put the garlic without the cuticle into the groove, press it and then you will get the well-proportioned minced garlic easy.